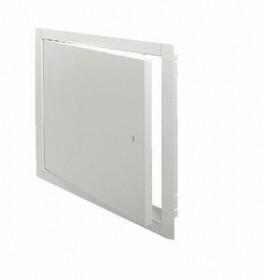 We stock many MIFAB model UA wall/ceiling access doors, in sizes ranging from 6" x 6" to 24" x 24"! These access doors are not only economical, but they're also attractive! A concealed hinge and white baked enamel finish are standard. The MIFAB UA is a multi-purpose access door. It is designed for flush installation into drywall, block or tile, walls and ceilings. The door features rounded safety corners, concealed hinge, flush with frame fit, a unique white finish, and a 1/4" turn back in the door panel for extra rigidity and safety. Material - UA Series is 16 gage satincoat steel door and 16 gage satincoat steel frame. The UASS stainless steel Series is 16 gauge #304 stainless steel door and frame. Aluminum doors are available as an option up to the 24" x 24" (610 x 610) size. The door and frame is 16 ga., type 5052-32 aluminum. Finish - Satincoat steel doors have a primed white finish. Stainless steel doors have a #4 brush satin finish. Door - Flush to frame. Turned back around edges for extra rigidity. Frame - The frame has pre-punched mounting holes for simple installation. Hinge - Concealed pivot pins. Latch - Standard - Flush mounted, screwdriver operated cam. Optional - Allen key, cylinder key, paddle latch, or vandal resistant latch. All of MIFAB's cylinder key locks are keyed alike. Call us for more information, or to ask about pricing!